LINCOLN, NEBRASKA, 27 JULY 2010  The University of Nebraska-Lincoln’s Sheldon Museum of Art presents “Seductive Subversion: Women Pop Artists,” the first major exhibition devoted to the work of female Pop artists, opening July 30. Pop art, more than any other post-World War II art movement, is defined by a small group of American and British male artists. This show, featuring some work that hasn’t been exhibited in more than 40 years, explores the important contributions of women Pop artists. These female artists found inspiration in many of the same subjects as men, including advertising, celebrities and commercial culture, but they also brought their own experiences to the movement, creating collaborative works, emphasizing handcrafted objects and developing new mediums, such as soft sculpture. Artists in the exhibition include Idelle Weber, Rosalyn Drexler, Dorothy Grebenak, Chryssa, Marjorie Strider and Vija Celmins, among others. Sheldon will hold two gallery talks during the course of the show. Christin Mamiya, associate dean of UNL’s Hixson-Lied College of Fine and Performing Arts, will give a lecture titled “A Woman’s Work is Never Done: Pop Art and the Home” at 5:30pm on August 31. Sid Sachs, exhibition curator, will give a lecture titled “The Inevitability of Pop” at Sheldon at 5:30pm on September 14. The lectures will take place in the Sheldon’s Ethel S. Abbott Auditorium and are free and open to the public. “Seductive Subversion” is organized by the Rosenwald-Wolf Gallery at The University of the Arts, Philadelphia. This project has been funded by the Pew Center for Arts and Heritage through the Philadelphia Exhibitions Initiative with additional support from the Marketing Innovation Program. This project was also supported by the Andy Warhol Foundation for the Visual Arts. The Nebraska Arts Council and the Sheldon Art Association provided local support. Sheldon Museum of Art houses a permanent collection of more than 12,000 objects focusing on American art. Sheldon, 12th and R Streets on the UNL City Campus, is open free to the public during regular hours. The museum’s hours are: Tuesday, 10am to 8pm; Wednesday through Saturday, 10am to 5pm; Sunday, noon to 5pm; closed Mondays. For information or to arrange a tour, call (402) 472-4524. Additional information is also available at www.sheldon.unl.edu. Image: “First Lady (Pat Nixon), 1967-72,” photomontage by Martha Rosler. Courtesy of the artist and Mitchell-Innes & Nash, New York. 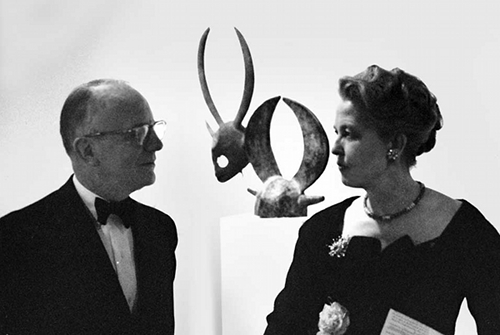 HOUSTON, TEXAS  John and Dominique de Menil, arriving in Houston from France in 1941, built one of the world’s great art collections, championed modern architects and filmmakers, and became passionately involved in human-rights causes. In the process they transformed the cultural landscape of their adopted city. The lavishly illustrated Art and Activism: Projects of John and Dominique de Menil is the first book to examine the couple’s wide-ranging interests over half a century  from art and architecture to philanthropy and politics. The de Menils established university art and media-studies departments; gave early architectural commissions to Philip Johnson and Renzo Piano; sponsored individual scholarships and funded civil-rights campaigns; built an ecumenical chapel with the painter Mark Rothko; presented one of the nation’s first exhibitions of racially integrated contemporary artists; brought Michelangelo Antonioni, Jean-Luc Godard and Roberto Rossellini to town; took the Surrealist master René Magritte to a rodeo; and introduced Max Ernst and Andy Warhol to an awed Houston. All the while they were building the art collection that would one day be housed in the world-renowned Houston museum that bears the family name  the Menil Collection. Art and Activism: Projects of John and Dominique de Menil is a book of many voices  artists, activists, students, scholars, and family. The couple’s accomplishments  as patrons, philanthropists and political activists who lived and worked along a Paris-Houston-New York axis  is told in lively texts and remembrances by contributors such as the artist Dorothea Tanning, architect Renzo Piano, film scholar Gerald O’Grady, architectural historian Stephen Fox, curators Bertrand Davezac and Walter Hopps, and Africanist Kristina Van Dyke. Illustrated throughout with works of art from the Menil Collection and rarely seen archival photographs, the large-format book also includes private correspondence and reminiscences from artists such as Marcel Duchamp, Jasper Johns, Man Ray, Barnett Newman, Robert Rauschenberg, Mark Rothko, and Niki de Saint Phalle. John and Dominique de Menil embraced all things modern and progressive. But as Josef Helfenstein and Laureen Schipsi write in the book’s preface, little prior to Houston indicated the direction of their interests or the fierceness of their commitment to art and activism. The Menil Collection, which anchors a green campus of museums, sculpture parks and art-filled chapels, speaks to the couple’s ecumenicism, commitment to human rights, devotion to individual artists, and prescient leadership in exploring cultural heritage issues. John and Dominique de Menil met in 1930  at a ball at Versailles (that neither wanted to attend)  and were married the following year. An heiress to the Schlumberger oil-field services fortune, Dominique held degrees in physics and mathematics from the Sorbonne; Jean (who would anglicize his name to John) hailed from a military family of more modest means. Had it not been for World War II’s approach, the young couple surely would have stayed in Paris. But John, who joined Schlumberger’s Romanian office as supervisor of operations, was forced to flee Europe after aiding the Resistance. The family  there would eventually be five children  reunited in Houston, home of Schlumberger world headquarters. Finding themselves in a new frontier, John and Dominique were determined to make a difference  and with the de Menils, making a difference began at home. To accommodate their expanding art collection and growing family, they commissioned Philip Johnson to design a modernist house. Dominique then hired the brilliant couturier Charles James to create a colorful, nearly baroque interior  the last thing you would expect to see in an otherwise severe International-style house. Now known as Menil House, it became a laboratory for the museum  “its DNA,” said the Menil’s founding director, Walter Hopps. The de Menils saw it as a salon, the scene of lively kitchen-table dinners and debates, with many of the era’s artists and thinkers in attendance. The rapid growth of the de Menils’ art collection was astounding, given its modest beginnings: a Max Ernst portrait of Dominique that took her years to appreciate followed by a small Cezanne watercolor that John bought for $300 and brought home in his briefcase. After the war the couple began to acquire more European paintings and American contemporary works. The de Menils were known to buy entire shows from their favorite New York and Paris galleries, including iconic examples of Pop Art, Minimalism, and Surrealism. John died in 1973, shortly after the dedication of the Rothko Chapel. Dominique survived him by a quarter of a century, opening the Menil (Renzo Piano’s first U.S. commission) in 1987. Sited in a leafy residential enclave in Houston’s Museum District and bathed in natural light, the Menil presents art in a tranquil setting. Piano has described the Menil as a “portrait” of his client  “discreet, intelligent, welcoming, elegant.” Admission to the museum  and to all of its galleries, special exhibitions and programs  is always free of charge. The institutions founded by the de Menils evolved into international forums that honor and further humanitarian causes. During her final decade, Dominique (who died in 1997) deepened her involvement in social causes, joining with former President Jimmy Carter to establish the Carter-Menil Human Rights Foundation. She created an award, sponsored by the Rothko Chapel, given to those who struggle against oppression, and established the Oscar Romero Prize in honor of the slain El Salvadoran bishop.